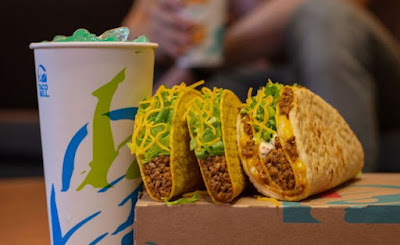 Alongside the return of Nacho Fries, the Double Cheesy Gordita Crunch also returns to Taco Bell for a limited time this winter. The Double Cheesy Gordita Crunch is basically a meatier version of the regular menu's Cheesy Gordita Crunch but with a second helping of seasoned beef which joins the melted cheese that holds the flour tortilla to the crunchy taco shell. The suggested price for the Double Cheesy Gordita Crunch is $3.49 (compared to $3.39 for the regular Cheesy Gordita Crunch). The Double Cheesy Gordita Crunch is also available as part of a $5 Box combo, which also includes two crunchy tacos and a medium fountain drink.